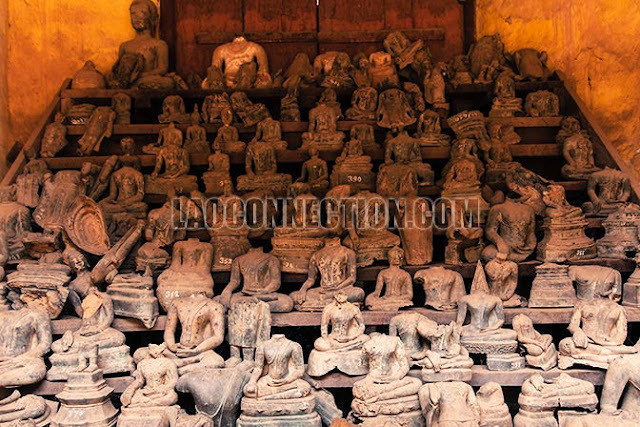 In Laos, Buddha statues are considered sacred. Even if damaged, and in some cases headless, it's forbidden and sacrilegious to just throw out the remaining parts. Because of this, temples store Buddha statues as seen here at Wat Sisaket in Vientiane. Some of these were accidental damage and in some cases it was intentional. For example, when invading powers entered Laos, they would destroy Buddha statues believing that locals hid riches inside of them. And in other cases, only the heads were taken away by looting antique collectors.